I was excited to try this new Haagen-Dazs flavor of ice cream. 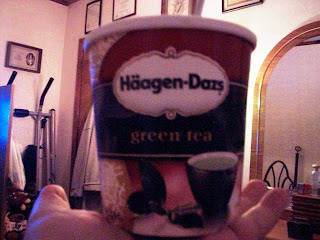 I had never seen it at Stop & Shop before, and was curious as to how the ice cream was actually going to taste like tea. I was hoping that I was not about to pay $3.50 (the sale price) for a pint of crap. 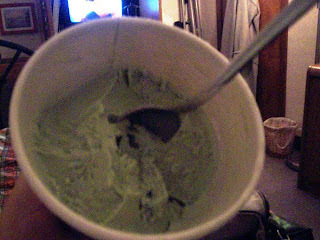 When I got it home, I excitedly took out a spoon and dug into the pea green ice cream. I could not taste the tea flavor at all. Actually, I couldn't taste anything. I gave Mom a spoon and she sampled it as well. She could very faintly taste the tea flavor, but I still couldn't. I retreated to my bedroom with the pint and really started to chow. THE VERDICT: I still don't know! I liked it, but I don't know why. It didn't have a flavor to me. At one point I did taste the green tea, but it was only for a moment. It didn't really have a distinct taste. This could be because, as my friend Scott pointed out, green tea really doesn't have a strong flavor. Would I buy this ice cream again? Yes, but perhaps I would wait and let it get a little warmer before I start to eat it. I heard that when ice cream is a little soft, the flavor really pops. We'll see!